This trek will take you to the famous Orkhon Valley National Park, in Central Mongolia. Its vast steppes and rich grassland makes it the perfect place to enjoy long galloping and see animals grazing around nomadic gers. This region was able to preserve its Mongolian nomadic tradition and archeological site for centuries allowing it to be part of the UNESCO World Heritage List. You will also spend 3 days in total immersion in the 8 Lakes protected area, accompanied by pack-yacks carrying your equipment. You will have to opportunity to see various flora and fauna species in an environment free of people. And you will spend your nights camping next to the lakes in a very relaxing atmosphere. You will have the opportunity to stop and share some milk tea and dried cheese with the locals. The route will be very gentle constituted of open steppe and small hills allowing a lot of galloping. You will ride about 35 to 40km per day. This trek has a logistic vehicle with camping equipment and cook. Each night you will be camping in this beautiful valley under a starry sky. Day 7. Mogoit Hot Spring. You will leave Stepperiders in the morning and drive towards Central Mongolia to your destination Kara Khorum. On the way you will stop at the Elsen Tasarkhai Sand Dunes, where you will see many camels. Those dunes are located in the middle of the steppe and we call this area the mini-Gobi. If you wish you will have the possibility to rent camels to go on a short camel ride. You will then continue to Kara Khorum,Chinggis Khan’s Ancient Mongolian Capital city where you will camp for the night. In the morning you will start by visiting the Erdene Zuu Monastery which is now one of the most important Buddhist Monastery of the country. 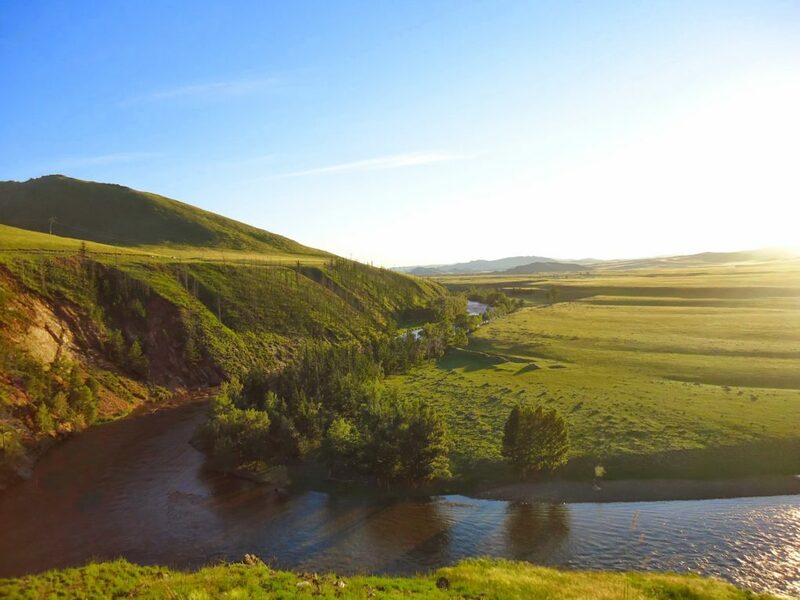 After the visit you will drive to the Orkhon Valley stopping at the national park’s entrance to see the beautiful view of the Orkhon River and its valley. You will then drive to the nomadic family who will provide the horses for your horse trek. You will spend the rest of the day with them and will have the chance to observe nomadic life: herding and milking the animals, preparing food etc.. You can even have try if you wish ! You will sleep overnight in a ger. You will continue your trip further in the protected area seeing other lakes. On the way you might meet nomadic families and stop to say hi and share some milk tea in their ger. You will ride back to the Orkhon Valley and follow the river until you reach its famous waterfall called Ulaan Tsutgalan, Orkhon Waterfall. If you are not afraid of heights and cold water you can walk down the valley walls and swim in the pool at the bottom of the waterfall. You will ride to the Mogoit (Snake) hot springs. You will go and see this source of natural hot water having the reputation to cure people. If you watch your steeps carefully you might have the chance to catch the glimpse of a snake! The ger camp next to the hot springs uses the spring water and provides thermal baths. If you are interested please let your guide know and bring appropriate bath clothing. You will ride to the Tovkhon monastery, a small buddhist monastery located on top of a forested mountain. The view from there is beautiful! You will be able to walk around and see caves in which monks have meditated for years! It is not possible to reach the monastery with a car so you will see many people going there on horseback or hiking. 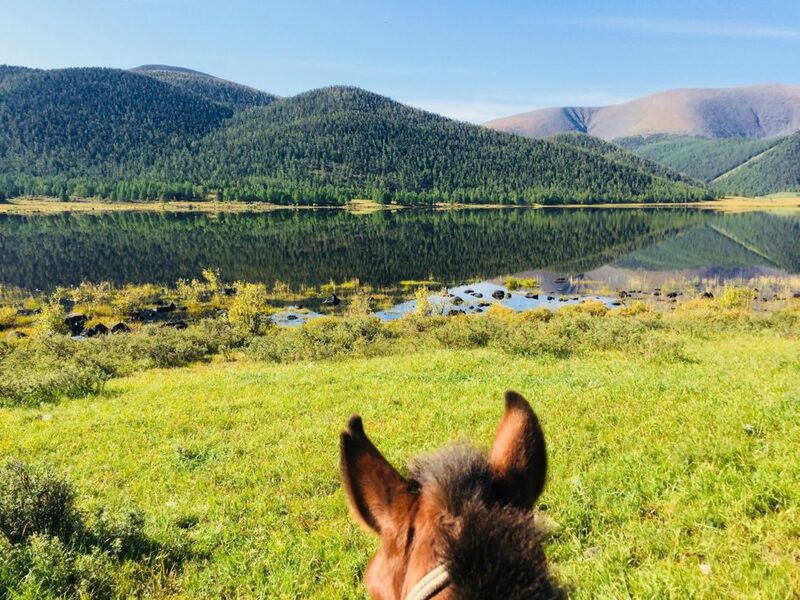 You will then ride back to the Orkhon River where you will camp for the night. This will be your last day of horse riding with your wonderful horses. Enjoy some last races in this beautiful steppe. 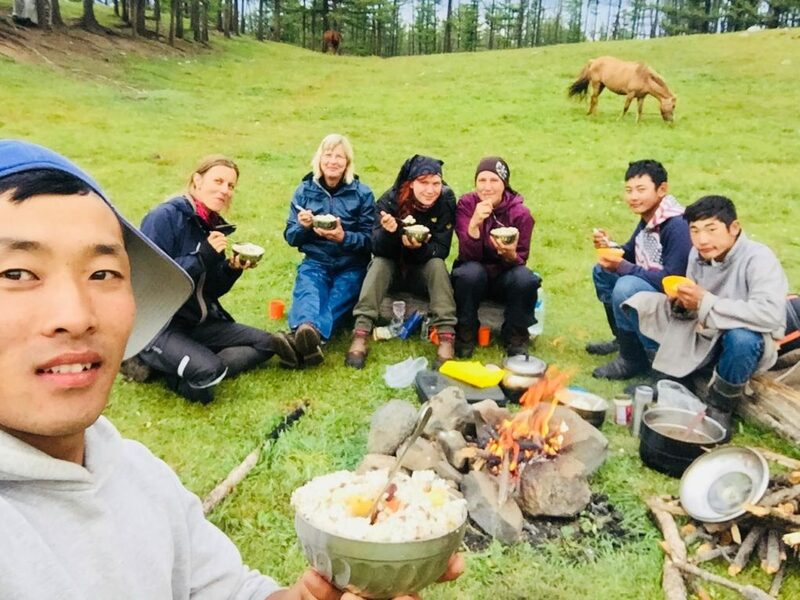 At the end of the day you will go back to your nomadic host family where you will be able to help them with their daily activities such as milking the yacks. You will celebrate the end of your trek with your guide and horsemen around a great dinner. Listen to some beautiful songs about Mongolia, love and horses. April, May and October also possible with an adapted version of this tour, contact us for more information. if none of the proposed dates suite you don’t hesitate to contact us to ad a new trek! 4 – 6 pax: 1,600 USD per person. 2 – 3 pax: 1,750 USD per person.